Son of Nebuchadnezzar. Set Jehoiachin free. Why did the son of Nebuchadnezzar release Jehoiachin? Perhaps Nebuchadnezzar told him to when he died? Perhaps it was the influence of Daniel? It is possible that he was released because of the example of the Jewish people in captivity. The Babylonians no longer thought of them as a threat. Jehoiachin in the genealogy of Jesus, but not through Mary, proving that Joseph could not be Jesus’ biological parent. Jesus had a legal right to the throne through his step-father, Joseph in the lineage of Jehoiachin, however, there was a curse on that line (Jeremiah 22:24-30), but there was a spiritual lineage, through Mary. Eventually, he and his family surrendered to Nebuchadnezzar, and were taken captive to Babylon. Although Jehoiachin was in captivity, he was considered the rightful king among the exiles according to both Ezekiel and Daniel. Jehoiachin had endured 37 years in prison before he was released. Those years must have been excruciating. Suffering comes upon us for many reasons. A lot of the time, it comes as a result of our sin, as in the case of Jehoiachin. He did evil in the sight of the Lord, and he suffered for it. Obedience is extremely important. Then there are other times, when we suffer through no fault of our own. We may stand up for what is right and, therefore, we go through persecution, like a political prisoner. People like Aleksander Solzhenitsyn, Richard Wurmbrand or Nelson Mandela, who went through difficulties because they stood up for what they believed. We may or may not agree with them, but we can respect what they endured. Psalm 107 tells of the power of testimonies to declare the goodness of God. God is good to those who cry out to Him. Whether we are in trouble of our own making or not, He is there to help, and we see the goodness of God. In April of 2014, I was diagnosed with stage 3, renal cell carcinoma, or kidney cancer. I had been experiencing fevers since January of 2014 and was fatigued. Originally, we had thought it was some sort of parasite I picked up while on a missions trip to Cambodia in 2013. But after some tests, doctors determined that I had a 7cm tumor on my kidney and, what was thought, to be in the vena cava, a main artery to the lower part of the body, and they were going to determine if it was operable. My doctor called me to confirm the diagnosis of cancer. Monica and I held hands. I knelt beside the bed, and we cried and prayed and prayed and cried. Next, I gathered Cody, Jared and Andrew together and told them the news. We cried together and I tried to answer as many questions as possible to the best of my ability. I had the first operation in Dallas on July 1, 2014. Doctors determined that the tumor had not entered into the vena cava, (although tumor thrombus, or blood clots where present), nor did the cancer spread anywhere else in the body. I was on the mend, everything looked great. I went back to normal life. After eight weeks, I went back to work. I started feeling fatigued again. In fact, at one point, I fell asleep at my desk at work. Eventually, the fevers returned and my left leg started getting numb, like it was falling asleep. We weren’t really sure what it was, but wanted to make sure. I went to my GP, who referred me to my Oncologist, who set up an a bone scan on October 24th to see if the cancer was active again. The night before the scan, I was changing and lifted up my right leg, then my left leg gave out, and I fell on my back. It was one of the most excruciating feelings I had experienced to this point. I tried to lay and rest a bit to see if it would go away. It wouldn’t. Monica wanted me to go to the hospital, but I wouldn’t go. Eventually, the pain was too much and we went to the ER. While there I told them I was a cancer patient and had fallen. After a bit, I was given a CT scan. I remember laying in a stretcher, Monica in a seat a few feet from me when the ER doctor entered the room with the results. I thought I had injured my back from the fall. The doctor said, “Mr Marquez, you don’t have a back problem, your cancer has returned.” He said that there was a 6cm tumor in my spine that had grown back in about three months. After he left to begin paperwork to have me admitted to the hospital, I looked over at Monica and said, “I wonder if I’ll be here for Christmas?” I was now stage 4, metastatic RCC. I had the first surgery in July, it was now October. I figured the cancer was so aggressive it would be unstoppable. I went by ambulance the next day to St. Vincent’s Infirmary in Little Rock, which was the first bed available at a hospital in-state that could handle my kind of problem. It was a great blessing that I went there. After that ride, I was placed in a room in the NICU and met Dr. Stephen Shafizadeh, my Neurosurgeon. He discussed different options with me and said that he would get a team of doctors together and come up with a plan in the next few days. Later, he told me that he was looking for a surgeon that would get him to my spine so he could take get the cancer out of my body. The first on November 7, 2014, to embolize the tumor to keep me from bleeding to death. It took 5.5 hours. The second was on November 10, 2014, going through the front, removing tumor from my spine, nerves and psoas muscle. Doctor Shafizadeh scraped the cancer off the nerves as one of his partners, Dr. Raja, held them. 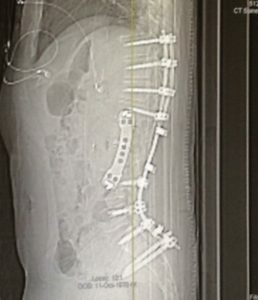 They also removed two of my vertebrae, L-2, L-3 and placed a cage in their place. During the surgery, they had to collapse my lung in order to reach the area affected by cancer. It took 7.5 hours. 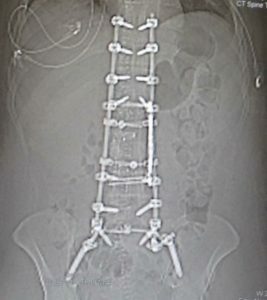 The third on November 18, 2014, placing metal rods and screws on my spine from T-10 to my pelvic. All three surgeries were within 11 days. The surgeries were so long that another pastor told me that he expected that Monica was going to post on Facebook that “Steve had gone home to be with the Lord.” It took 10 hours. When I came out of surgery, I had experienced an incredible amount of darkness. It was something that I had never experienced. The LORD had never left me, but it was as if He said, “This is what you would be like without me; with out my light.” I hated the feeling. It was terrifying. Usually you experience difficulties like this as a believer and expect to go through it singing and praising the Lord the whole time. But I didn’t. I was extremely fearful. I had never thought of myself as a fearful person, but I was terrified. I sought the LORD, but nothing seemed to help except Monica in the room. You never get sleep in the hospital. I don’t know what it is about nurses, but they always seem to want to wake you up at 4am. Because of my collapsed lung, they had to do daily X-Rays of my lungs to make sure they were filling properly. I also had to do breathing exercises. The X-Ray machine must have been from the children’s area because it had a large base, a neck, where they would point to the machine at me to take the X-Ray and spots all over it shaped like a giraffe. They would wheel it in, then they would have to put a film board behind me in the bed, which stiffened my back and caused me an enormous amount of pain. Sadly, I fought the nurses, which made me stiffen up even more, which caused even more pain. Every morning I would wake up and ask the nurse, “Do they have to bring the giraffe in today?” She would look at me kind of puzzled, then look at Monica, who would say, “Oh, he’s talking about the X-Ray machine.” The nurses would laugh! There is much more, but after my time in the NSICU and the floor of the hospital I was released to a physical therapy place called, HealthSouth. I remember the day I was released, I said, “Praise the LORD!” Dr. Rajah said, “Oh, yes, praise the Lord. I told your wife, It was not us that did this surgery, it was too complex, there was an angel in the room that did it.” They were amazed at how well I was doing. I was at HealthSouth for almost a week, beginning in a wheelchair, unable to walk steadily, then to a walker. I was released and had 6 months of outpatient physical therapy. I remember going in for one of my appointments with Dr. Shafizadeh and him asking me to walk around the room a bit. I went for the door of the exam room to walk in the hallway, but he didn’t want me to overexert myself. I walked a bit in the room and then he opened the door and wanted me to walk in the hallway. He was absolutely amazed and wanted to video my walking with his phone. When we went back into the room, he put his hand to his forehead and was in shock. He said, “I have seen the muscle where the cancer was with my own eyes. You should not be walking.” He went on to say that he believed that this had to be God that did this, there is no other explanation. For the believer, we know that there will always be deliverance. We will be healed one way or another. Death is the great liberator. The Thirty-seven years that Jehoiachin spent in prison would seem like nothing compared to all eternity. The same for me. There is a great liberator, which is death. It is a hopeful liberator. It ends all suffering for the believer. It is the ultimate healer, where we go and see Jesus. It is a blessed hope. God can bring total and absolute healing. I will trust that He will until He decides it is not His will. Then I will go home to spend eternity with Him. “You only have power over people so long as you don’t take everything away from them. But when you’ve robbed a man of everything, he’s no longer in your power – he’s free again.” Aleksandr Solzhenitsyn, spent 11 years in labor camps and exile. Spending all this time in prison, made Aleksandr Solzhenitsyn realize that the suffering that he went through took away his desire for things. That is what suffering does. It makes us long for the ultimate healing. It makes us desire heaven. Having never thought that it was possible that he would ever be free, Jehoiachin had no expectations once he was free. Everything, from the sun shining in his face, to the smell of the fresh cut grass, to the blessing of clean clothes were like the riches of the kingdom. It was sweet to him, it was beauty. It was the blessing! The heart of wisdom is that our days are numbered. We do not know when death will come, but it will come or the Lord will come back, either way, our existence on this planet will end. The wisdom of knowing our days are numbered is our priorities. Are we living for this life or the next? Which is better? You see, we have all been given a death sentence. A doctor could tell you that you have six months to live, then you could step off a curb, get hit by a car, and die the next day. You see, the doctor was wrong. You didn’t have six months, you had one day. What will you do with that day? The music is wisdom. We dance to a different beat. Suffering allows us to hear the music, attend the dance, be free from the chains of this earth. Suffering can make or break a person. Jehoiachin was released from the bonds of almost four decades! Eating at the kings’ table and enjoying the pleasures of the court must have seemed surreal to him. It would be hard to imagine that he would be at home there any time soon, although it would be a great joy. The same is true for the soul that is liberated from earth to heaven. The sorrows of this world that are endured are all at once shed and the joy of heaven abounds forever and ever. But this may not have been the case for jehoiachin. The writer doesn’t tell us that he changed his ways. Remember, he was free, but he was still one who had done that which was evil in the sight of the LORD. “A man’s greatest enemy is himself. Deliverance of the body from a dungeon is a small boon if the soul is still captive to sin. The salvation in Christ effects this complete deliverance.” Pulpit Commentary, Jeremiah, pg. 316, III. Sometimes we seek freedom from our sorrows and not freedom of our souls. We want relief, but we want it on our terms. The saddest thing in the world is when we get it. We can only be happy when we surrender our hearts and minds to Jesus. When we do, we are not only liberated from our griefs, but from our sin, and we have the hope of heaven. There is no greater love, no greater joy, no greater hope, than this.